However, after the death of Matsudaira Nobuyoshi, the relationship between the temple and the Matsudaira family gradually became estranged. 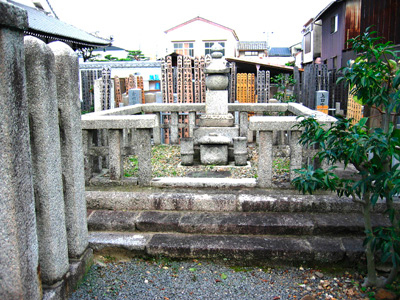 As time slipped away, temple lost 300 koku of temple estate and the appearance of the temple fell abruptly. Here, let us talk about the story of the third-generation chief priest. The priest had one adorable cat. For the priest who had lost allowances, he did not have any choice but to rely on the charity of religious mendicancy on a daily basis. However, the priest loved the cat so much and did not let go the cat even though he had to starve himself to share some of his food with the cat. One day on the full moon night, the priest returned from a wandering mendicant with weary footsteps. When he passed through the temple gate and reached close to the main hall, he stood stock-still for a moment in astonishment. He saw a beautiful princess wearing elegant dress and dancing gracefully with a fan under the moonlight. 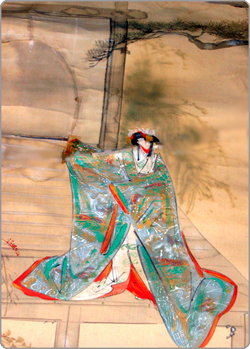 On the shoji screen in the main hall, he saw a shadow of his loving cat in the back of the princess in a reflection under moonlight. When the priest saw the princess in disguise, he got angry and threw out the cat from the temple because there was no time for playing and dancing while he had to go through hard times getting some food. A couple days after the cat disappeared, the priest's cat appeared in his dream and told him "Tomorrow, samurai warriors will come to the temple. Give them a special reception and the temple will flourish again." Next morning, the samurai warriors of the Matsudaira family visited the temple just like the cat said, and asked the priest to enshrine the deceased daughter in the temple. Since then, the temple was reinstated in its position with the Matsudaira family and the temple became more flourished more than before. There is an old pine tree on a premise of the temple that is said to be planted by the priest to cherish his loving cat. It is also called neko matsu, or cat's pine tree, and its wide branch extending 20 meters long in parallel with the ground is said to represent a cat lying down sideways. Since then, Shonenji Temple has held memorial services in cordially to spirit of deceased animals.